This outstanding piece of jewelry is crafted in beautiful rich 14K gold and features a genuine approx. 9.5 X 7.25mm Pear cabochon Green Jadeite jade, as well as, 2 genuine approx. This piece has a crisp/secure hinged pin with locking clasp and is sure to delight anyone who wears it. The birds feathers are done in a textured 18K yellow gold, while the face & beak have a shiny 18K yellow gold finish. The body of the Brooch is covered in pave set diamonds about 1 point each (qty 16). Vintage Ruby & Diamond 14k Yellow Gold Bumble Bee Ring, size 8. There are 8 rubies that measure 2mm in diameter & 6 that measure 1.5mm in diameter. The diamond measures 2mm in diameter. The ring is stamped 14K and weighs 4g (including the stones). It is in excellent condition and will be shipped safely and securely. Payment is expected within 2 days of purchase, unless prior approval has been received. I am a registered business so Texas residents will be charged sales tax. I offer free returns, so if you are unhappy with your purchase for any reason, you may return it for a full refund (I pay return shipping). Solid 14K Yellow Gold Turquoise and Ruby Dragonfly Brooch. Beautiful solid 14K yellow gold and turquoise dragonfly brooch with ruby eyes. Measures 1.75" x 1.5" and weighs 6.4 grams. He was made of 18K yellow gold, round head with a pair of natural blue Tourmaline eyes and in ruby nose. His body colored with satin and glossy surface. weight 5.8gm, hallmark and acid tested for 18K. The two-tone gold insect is approx.,1" x 7/8" and a total weight of 4.1 grams. Beautifully decorated with engraved details and a multi-textured finish. This Spring ready,Bumble Bee brooch has a safety catch/pin stem closure. The main stone is an Sapphire, it is 2mm north to south and 2mm east to west, approx carat weight of 0.03. Total approx carat weight of 0.09. It is fully hallmarked, has been tested, and verified weighing in at 3.0 grams. Has Ruby Eyes. Marked 14k & 585. Weighs 6.5 grams. MAIN STONE Rhodolite Garnet. OTHER GEMS Pearl,Peridot,Ruby. PEARL 6.0 MM. FACE BROOCH 74.0 X 34.0 MM. PRODUCT TYPE Brooch. PLATE 2-Tone White & Yellow 14k Gold. MAIN STONE SHAPE Round Cut. TOTAL weight 75.44 ct (total weight of silver stone). MAIN STONE COLOR Creamy White. PEARL 9.0 MM. FACE BROOCH 47.0 X 46.0 MM. PRODUCT TYPE Brooch. MAIN STONE Pearl. TOTAL weight 66.58 ct (total weight of silver stone). Any single item weigh over 300ct is not eligible to combine. The 14K gold basket alone - a work of art, with detailed basket weave design and twisted handle.The leaves and stems of the flowers are artistically sculpted. The brooch is signed (not sure of the artist / maker). October - Opal & Tourmaline November - Topaz & Citrine December - Tanzanite & Turquoise. July - Ruby August - Peridot September - Sapphire. MAIN STONE SHAPE Marquise Cut. OTHER GEMS Ruby,Sapphire. PRODUCT TYPE Brooch. Antique Platinum &18K Yellow Gold Diamond and Ruby Pin/Brooch. Amazing piece !!!. Old mine cut diamonds , VS1 super clean F color and SI1 total weight in diamonds approx 2.25-2.50. Natural Rubies very clean 1.50 -2.0 Ctw Have additional hoop to make this piece wear as a pendant. Excellent conditions. Gorgeous piece. Any question send trought inbox!! Condition is Pre-owned. MAIN STONE Larimar. OTHER GEMS Ruby,Sapphire. PRODUCT TYPE Brooch. FACE BROOCH 54.0 X 26.0 MM. PLATE 2-Tone White & Yellow 14k Gold. TOTAL weight 67.49 ct (total weight of silver stone). MAIN STONE COLOR Top Nice Blue. Item Description: Retro 1940s 18k Yellow Gold and Platinum and set with 3cts in SI1 VS2 G Old Euro and Single Cut Diamonds. 4cts in Square Cut Natural Ruby gems. 7cts total and so nice. Retail $7000. Awesome find. Stone: Natural Diamond and Ruby Metal: 18k Yellow Gold and Platinum Length: 1.75 Inches Gram Weight: 9.3 Grams . PRODUCT TYPE Brooch. FACE BROOCH 36.0 X 32.0 MM. MAIN STONE Sapphire. MAIN STONE SHAPE Oval Cut. PLATE 2-Tone White & Yellow 14k Gold. MAIN STONE COLOR Top Rich Yellow. TOTAL weight 50.98 ct (total weight of silver stone). FACE BROOCH 52.0 X 27.0 MM. PRODUCT TYPE Brooch. MAIN STONE Sapphire. MAIN STONE SHAPE Round Cut. PLATE 2-Tone White & Yellow 14k Gold. TOTAL weight 39.76 ct (total weight of silver stone). MAIN STONE COLOR Multi-Color. OTHER GEMS Rhodolite Garnet,Ruby,Tourmaline. PRODUCT TYPE Brooch. FACE BROOCH 50.0 X 37.0 MM. PLATE 2-Tone White & Yellow 14k Gold. MAIN STONE SHAPE Round Cut. Any single item weigh over 300ct is not eligible to combine. MAIN STONE Tanzanite. MAIN STONE SHAPE Marquise Cut. PRODUCT TYPE Brooch. FACE BROOCH 45.0 X 42.0 MM. October - Opal & Tourmaline November - Topaz & Citrine December - Tanzanite & Turquoise. PLATE 2-Tone White & Yellow 14k Gold. MAIN STONE Rhodolite Garnet. PRODUCT TYPE Brooch. FACE BROOCH 55.0 X 34.0 MM. OTHER GEMS Ruby. PLATE 2-Tone White & Yellow 14k Gold. MAIN STONE SHAPE Round Cut. Any single item weigh over 300ct is not eligible to combine. PEARL 5.0 MM. FACE BROOCH 62.0 X 32.0 MM. PRODUCT TYPE Brooch. PLATE 14k White Gold. MAIN STONE Pearl. MAIN STONE SHAPE Round button. TOTAL weight 69.75 ct (total weight of silver stone). MAIN STONE COLOR Creamy White. MAIN STONE Larimar. October - Opal & Tourmaline November - Topaz & Citrine December - Tanzanite & Turquoise. July - Ruby August - Peridot September - Sapphire. PRODUCT TYPE Brooch. FACE BROOCH 43.0 X 28.0 MM. 20 gram - Chunky - Heavy. Cant make it out - see photo. Lots of fine detail can be seen in photos. Clasp works properly. Maked: 18kt. October - Opal & Tourmaline November - Topaz & Citrine December - Tanzanite & Turquoise. July - Ruby August - Peridot September - Sapphire. PEARL 6.0 MM. FACE BROOCH 64.0 X 34.0 MM. PRODUCT TYPE Brooch. WE HAVE A STRONG KNOWLEDGE IN ESTATE SILVER AND ESTATE JEWELRY. WE DESCRIBE EVERYTHING TO THE BEST OF OUR KNOWLEDGE. one 2.7mm clean diamond & 2 small rubies. ITEM SIZE & WEIGHT. ITEM IS IN NICE READY TO WEAR! 14 kt Yellow Gold Bumble Bee Pin, containing Round Ruby eyes. Pin and clasp back. 8 Full Cut Diamonds approx. October - Opal & Tourmaline November - Topaz & Citrine December - Tanzanite & Turquoise. July - Ruby August - Peridot September - Sapphire. OTHER GEMS Ruby,Sapphire. PRODUCT TYPE Brooch. FACE BROOCH 52.0 X 28.0 MM. Flag is signed BJC 14K. That is Samuel Benham (famous for his be-jeweled bee pins). The pole is 1 5/8" long. Pin is clean and is very good wearable condition. VS GOOD QUALITY WITH VERY SLIGHT INCLUSIONS. CAN SEE BY NAKED EYE. BUT NO EFFECT TO THE BEAUTY. SI2 INCLUSIONS, CRACK ARE EASY TO SEE WITH THE NAKED EYE. IF EXCELLENT QUALITY FREE OF INTERNAL INCLUSIONS. OTHER GEMS Ruby,Sapphire. PRODUCT TYPE Brooch. FACE BROOCH 51.0 X 25.0 MM. MAIN STONE SHAPE Oval Cut. Any single item weigh over 300ct is not eligible to combine. PLATE 2-Tone White & Yellow 14k Gold. MAIN STONE Lemon Quartz. MAIN STONE COLOR Top Lemon Yellow. PRODUCT TYPE Brooch. FACE BROOCH 35.0 X 33.0 MM. HARDNESS 5.0 - 9.0. MAIN STONE SHAPE Oval Cut. PLATE 2-Tone White & Yellow 14k Gold. TOTAL weight 57.04 ct (total weight of silver stone). Weight: 7.7 grams. Handling cost for this item is Free! It is fully hallmarked, has been tested, and verified weighing in at 4.8 grams. There are no problems other than ordinary and normal use marks. 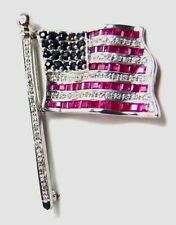 This brooch would be a great addition to any collection and would be an amazing gift! Cast and assembled yellow gold with a polished finish - made by EMA Jewelry. Sweet little 14K gold honey bee brooch set with brilliant white diamonds and lovely ruby spinels. 14 round standard cut brilliant lab-created ruby spinels with a total carat weight of 0.19ct. 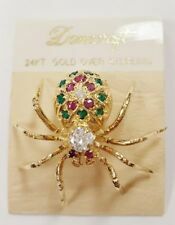 Lot of 2 Vintage 14kt Yellow Gold Spider Turantula Lapel Pins gold, red, & black beads. Condition is Pre-owned. Shipped with USPS First Class Package. 3.7 grams. Tested 14k unmarked. See pictures for details for they are part of the description. Please see other Fine Quality Merchandise. Thank you for viewing. MAIN STONE Zircon. October - Opal & Tourmaline November - Topaz & Citrine December - Tanzanite & Turquoise. July - Ruby August - Peridot September - Sapphire. PRODUCT TYPE Brooch. FACE BROOCH 50.0 X 37.0 MM. 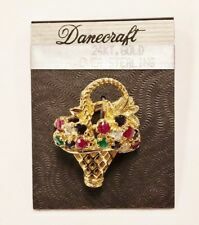 Vintage Estate 14K Yellow Gold Brooch Set With Rubies & Emeralds!! 10 Grams!! This Vintage Estate 14K Yellow Gold Brooch Set With Rubies & Emeralds!! The Brooch is 2" H x 2" W!! The Brooch weighs 10 Grams!! A Stunning Addition to your personal Jewelry Collection!! Contact me for more information on this Stunning Vintage Estate 14K Yellow Gold Brooch Set With Rubies & Emeralds!! Check out my other amazing pieces! I happily combine S & H costs on multiple purchases!! It is a bar style pin. The stones in this pin are natural genuine, one small diamond and one ruby. The pin is about 2" long. The weight is 2 grams. U.S.A. ONLY. MAIN STONE COLOR Creamy White. October - Opal & Tourmaline November - Topaz & Citrine December - Tanzanite & Turquoise. July - Ruby August - Peridot September - Sapphire. PEARL 6.0 MM. FACE BROOCH 29.0 MM. Brooch approx. 2.75" long x 1.825" tall. Accented with a Small Round Cut Ruby Eye, approx. Hallmarked & Marked " STERLING " on the back. Exact age unknown, probably early-mid to mid-late 20th century. This is not sizable. Center Stone Ruby. Weight Of Charm (7-7.7) Grams. Charm Cuts Good. we will make sure you are 100% satisfied with your. Consignment item from heirs! Appears to have never been worn. 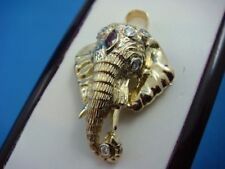 Solid 18 karat .750 yellow gold (11.9 grams) Emerald eyes and Ruby nose. Has a designer mark of "20/AL"? They believe their Mother purchased it many years ago in Europe. It measures approximately 1 1/4" top to bottom and about 1" in width. Lovely, exquisite, well made quality collectible!. Circular Ruby Diamond Endless Pin. 6 Natural Round Rubies 1.00ct.50ct natural diamonds. Vivid Red, Clean Clarity & Transparent. This pin is 21.13 grams of sweet purr-fection! West Hollywood, CA 90046. We will do our absolute best to work out a solution. Zoom in and out and review all photos. The item in the pictures is the item you get. 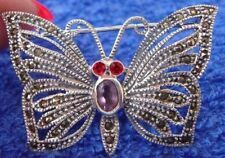 This is a 18 karat white gold, natural diamond and ruby pin brooch. It weighs 3.50 grams and it contains 1.50 CT of natural diamond and Ruby SI1.